Cedar trees has been a major problem to the ranches and agriculture lands in Southern Great Plains. According to Oklahoma Forestry Services, they are one of the oldest trees in Oklahoma and have been native to 73 counties. Over the past several decades it has posed a great challenge in managing agricultural lands and pastures due to its rapid proliferation across the forest and pastures in Southern Great Plains competing with growth of desirable biomass. This has led to reduce the quality of rangelands for wildlife habitat and cattle grazing. 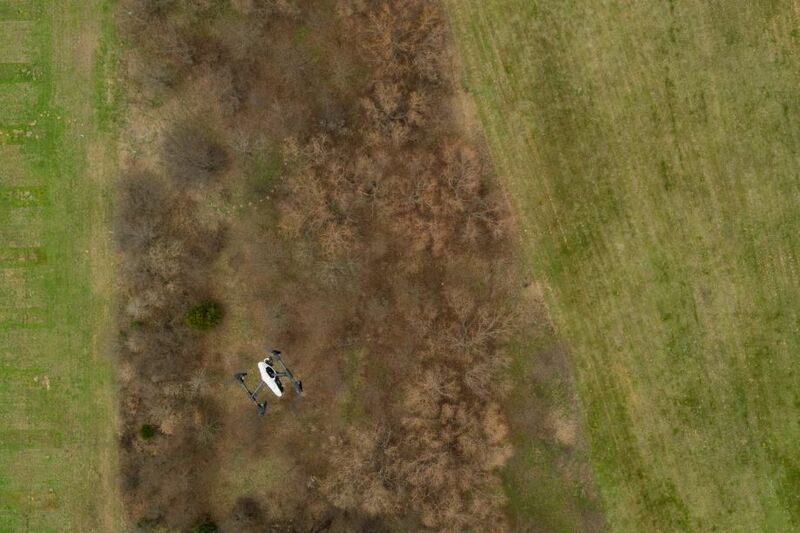 Although the accurate abundance and distribution is still not known, with the advent of technology like Unmanned Aerial Vehicles (UAVs) can help mapping out & quantifying the species encroachment so that farmers and ranchers come up with better treatment decision across their landscape. 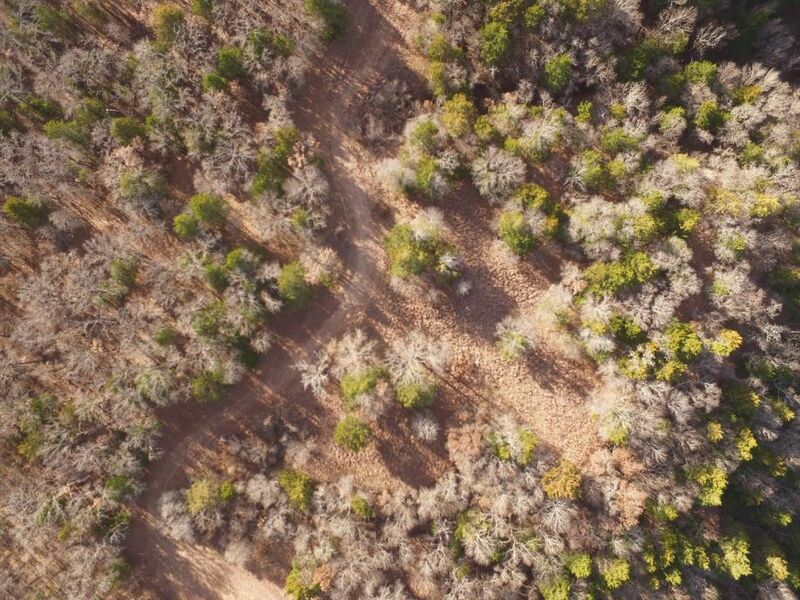 In recent years, UAV’s application has been increasingly used to address agricultural problems unlocking its further potential to quick mapping and managing ranch and pasture effectively. 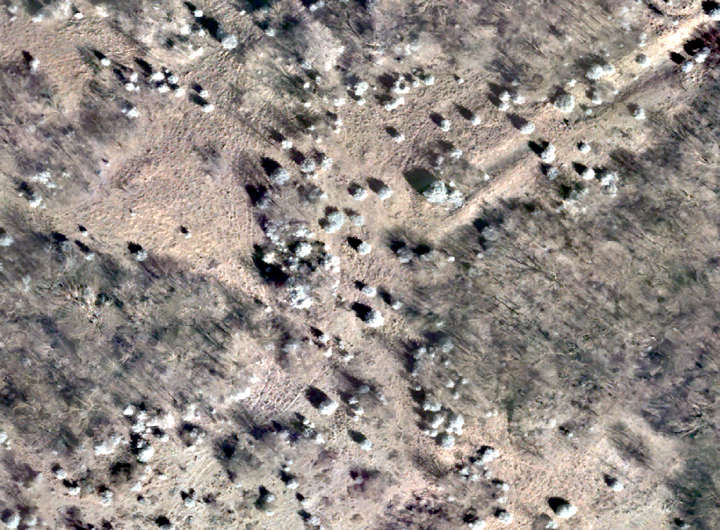 Fig a. Encroachment of Cedar trees on ranch. UAV’s or drone enabled with high-tech camera or sensors provides bird’s eye view of ranch and pastures that allows ranchers and farmers to understand what is going on their farm. The high-resolution imagery obtained from UAV’s helps to observe and assess their land and vegetation conditions routinely. While various sensors are out there in the market, it is important to know what type of sensors are applicable in achieving desired information and result. For instance, Visual Band sensor or regular normal camera provides high resolution natural color (RGB) image that helps to identify and understand things on the ground, whereas a sensor with multispectral bands (NIR/IR) has the greater capabilities to detect vegetation health and growth based on spectral properties of leaves. Multispectral sensor contains Infrared waveband that can detect the changes in vegetation condition that are otherwise unseen by naked eyes. To understand it more analytically, plants that reflect high amount of near infrared light wavelength determined healthy whereas high reflectance of red wavelength indicates less healthy or low vigor. This is often called Normalized Difference Vegetation Index (NDVI) that ranges between 0 and 1, 0 being low greenness or stressed vegetation and 1 as high greenness or healthy vegetation. Fig b. DJI’s Inspire drone scanning ranch from above. Prior to the operation, there are few measures that need to be taken under consideration to capture accurate information from UAV’s. First, the time of year for imagery acquisition. The best time to fly drone to capture accurate information is during the leaf-off season. Cedar trees being evergreen in nature, stand out from rest of the tree species. Using the principle of NDVI, the cedar canopies can be segmented out based on plant vigor represented with high NDVI values. In other hand, NDVI from most of the trees usually depicts low values which is because either their leaves fall-off or dried out. Second, data interpretation is crucial. The trees can be quantified with canopy structure and appearance from the imagery as top view of a canopy usually form circular or rounded type compared to irregular pattern of other tree canopies. Furthermore, the heat map can also be derived from the imagery that allows us to locate cedar trees distribution and hotspot areas. This further helps farmers and ranchers to perform better treatment of cedar trees. In addition, GIS analysis help further understanding its distribution pattern, counts, canopy cover and density of trees. Fig c. Infrared sensor distinctly capture cedar trees (bright white canopies) isolated from rest of the tree canopies. 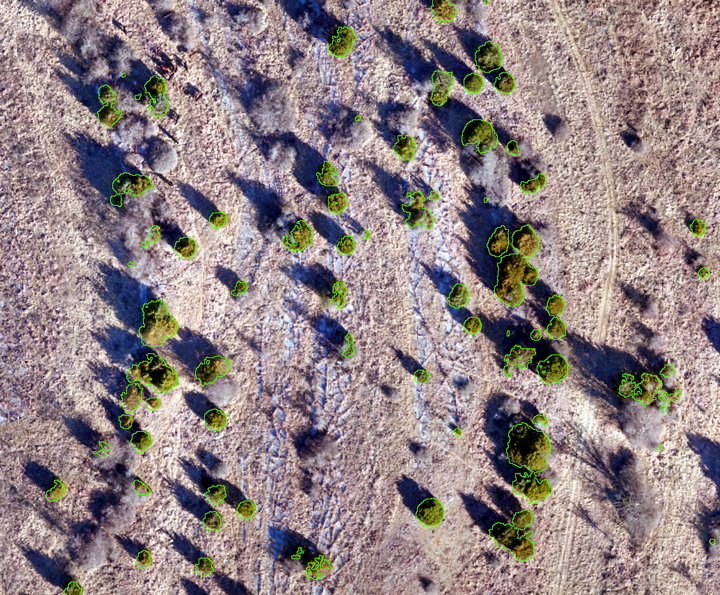 Fig d. Cedar tree canopies extracted from visual-band imagery using GIS software. While drone technology is one of the most cost-effective and inexpensive mediums to obtain the information remotely and in real-time, there are few technical hurdles associated with the utilization of this technology. First, it is important to know what we want to accomplish from the drone and how we want to fit the technology according to our objectives. There are various drones and sensors available in the market that offer several capabilities but understanding their types (e.g. Visual, IR, Thermal, Lidar) and applications are crucial. In addition, there are free third party software in professional drone mapping and photogrammetry that allow us to process limited amount of images on-the-fly, for e.g., drone mapper, Sentera’s FieldAgent, PrecisionHawk’s PrecisionMapper etc. However, there are cost associated with additional licenses depending on the data volume and advance capabilities of the software. Second, it is also very important to get familiarized with the technology especially adhering to legal guidelines under FAA jurisdiction for safe flight operation. Thus, before performing mapping and survey with this technology, understanding the technical aspect of hardware and software is highly recommended. This technology greatly empowers farmers and ranchers by minimizing cost, energy use, and most importantly time in much sophisticated way than ever before. It could be a promising technology in agriculture and ranch management for many farmers and ranchers in the Southern Great Plains. Kushendra N. Shah, GISP, is a GIS programmer analyst and a certified drone pilot at Noble Research Institute based in Ardmore, OK. At Institute, Mr. Shah provides geospatial data support and unmanned aerial system to various agriculture and plant science research programs. He is also keenly interested in utilizing geospatial bigdata analytics, IOT, machine learning and automation to bring actionable information in agriculture domain.